‘B’ Company, No 9 Platoon. Thanbyuzayat War Cemetery, Plot A16, Row C, Grave 19, Age 43. Albert Hackshaw died from ulcers at Tanbaya Hospital. He had been evacuated with other sick from ‘F’ Force to this hospital camp in Burma from the Force work camps in Thailand. Funeral service conducted by Chaplain Duckworth (British Army) on 15.11.1943. Actual burial was conducted at 0130 hours on 2.11.1943. In January 1918, aged 18 years and 10 months Albert enlisted with 28th Battalion, WW1, his service No. 52068. His occupation was recorded as Milk Carter. He had completed 12 months as a cadet. He was sent to Blackboy Hill and embarked at Albany in May 1918 sailing to Alexandria before reaching Southampton, England. He joined the reinforcements 28th Btn in France in October 1918. He was discharged August 1919. The Hackshaw family departed London 24 December 1912 on ‘Ajana’ to sail to Fremantle. There were 9 children recorded – Rose, Annie, May, Albert, Reginald, Janie, Beatrice, Gertrude & Alan and a further 5 were born in Western Australia. The family firstly resided at Bellvue where Henry Hackshaw was employed by the WA Government Railways and their youngest child Charles was born. In 1925 the family moved to Bencubbin and it appears there was a property or properties purchased by Henry and several of his sons including Albert. As is evidenced below, Albert, his father Henry and brothers Reginald and Frederick’s dreams of successfully farming wasn’t to be. Sadly they joined the 100s and 100s of Western Australians who took up land at that time and due to depression, low agricultural prices, rabbits and even the weather they were forced to walk off their land. It would have been a terrible time for them. It is thought Albert and Reginald moved to the north-west to work before enlisting. Albert was at Roebourne. In 1940 Henry and Rose moved to Cannington then South Perth. A further tragedy for the Hackshaw family was the death of Albert’s younger brother Reginald Hackshaw WX7800 who was KIA 1 Sep 1942 in Papua New Guinea whilst serving with 2/16th Btn. He was 36 years old and married. Note the brothers would have enlisted same day. Reginald was WX7800 and Albert WX7801. Albert’s last know recorded address was Carlisle where he shared residence with his younger brother Frederick Percy Hackshaw, however it is believed he was living in the north of WA prior to enlistment. 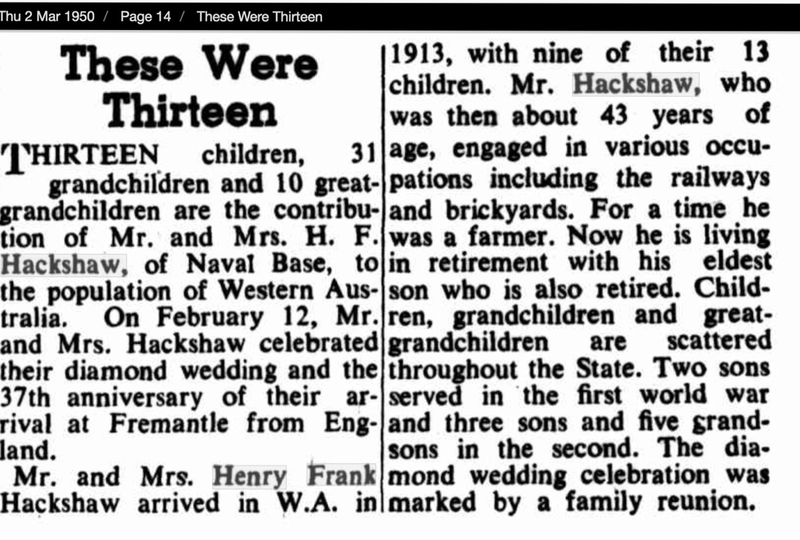 Henry Frank Hackshaw died in 1955.